PENSACOLA, FL - (August 15, 2011) - The new DecoGuard from Hy-Lite, a U.S. Block Windows Company, represents the industry's first impact-resistant, decorative glass window that offers remodelers and builders both safe and stylish protection from the dangers associated with hurricanes and tropical storms. The Hy-Lite DecoGuard window meets the stringent building code requirements for Gulf and coastal regions according to "wind zone 4" specifications. 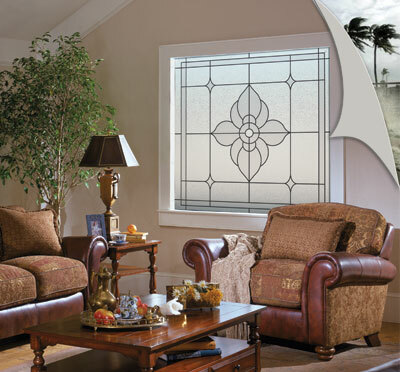 Constructed from a heavy-duty vinyl frame and impact-resistant laminated insulated glass, the 48-inch square designer window has an elegant floral design pattern that is kiln-fired directly onto the interior glass for long lasting beauty and durability. Dramatic black lines and rich, frosted privacy glass compliment the new impact-resistant decorative glass window. "Severe weather protection never looked so stunning,' says Tom Rachfal, Vice President of Sales and Marketing for Hy-Lite. "As builders and remodelers increasingly use windows as architectural focal points to add character and dimension, coastal communities can enjoy high-style and safety in one energy efficient product." Available in four designer frame colors: white, tan, driftwood and bronze; the DecoGuard decorative glass window is especially ideal for homes in coastal markets where stronger, weather-resistant windows are required by strict building codes. "For years the market has asked for an energy-efficient, impact window with stronger with higher design pressures that has style and character," says Rachfal. "The DecoGuard bridges the space between protection-grade utilitarian windows and a signature accent that a designer would put in his or her own home. Our DecoGuard windows are manufactured with superior strength, thermal efficiency and low-maintenance materials." The striking beauty of the DecoGuard architectural window belies its strength and ability to protect the building envelope from severe weather hazards. The new architectural window received a design pressure rating of 50 from Certified Testing Laboratories in Orlando, Florida, after meeting the AAMA 506-08 hurricane impact specification and the AAMA 101/I.S.2/A440-05 window standard. To meet "wind zone 4" specifications, the Hy-Lite DecoGuard window was tested to withstand penetration of an 8-foot, 2x4 stud shot out of an air cannon at 50 feet per second, twice. First, the projectile targeted the center of the glass, after which a second projectile was directed at the window's corner. Resistance to penetration was only the first part of the test. The second part of the test subjected the window - already struck twice by the wood projectile - to 9,000 cycles of a vacuum load - all designed to simulate destructive hurricane conditions and the resulting force and debris impact caused by severe weather. DecoGuard vinyl windows are precision engineered to provide worry-free beauty and performance and offer a 5-year limited warranty. First decorative glass window designed for hurricane protection. Vinyl Frame-more durable, energy efficient with welded joints to prevent leaks. life of insulated, tempered glass interior. Hy-Lite offers special discounts to builders on windows such as DecoGuard that are used in some model home communities. The fixed units are ideal for a full range of new-construction and retrofit/remodeling applications. Headquartered in Pensacola, Fla., Hy-Lite, a U.S. Block Windows Company, offers the widest selection of prefabricated privacy products in the industry. Product lines are offered under both the Hy-Lite and U.S. Block Windows brand names and include a variety of operable and fixed acrylic block and decorative glass windows. Additional product offerings include glass block windows along with an assortment of acrylic block shutters, accent panels, radius walls, partition walls, door inserts and shower kits. For more information visit www.hy-lite.com and www.usblockwindows.com or call 888-256-2599.